Whey is a by-product of cheese manufacture resulting from drainage of liquid from the curd(1). It contains lactose, protein, ash, and lipids. The protein concentration at this stage of processing is about 67 protein. Whey proteins can be fractioned and concentrated via a process called micro-filtration to yield whey protein concentrates (WPC). The protein concentration can be as high as ~ 95% protein after the removal of the fats and lactose. WPC’s are an excellent source of nutrition and are high in lactalbumin, minerals, and vitamins. It possesses a number of functional advantages such as solubility, high water retention, foaming and gelation(1). As a result of these qualities, whey protein concentrates (WPC) have been used in a wide range of food products such as the formulation of dairy foods, egg white replacement, beverages, surimi and comminuted meat products (1). In response to the efficacy of whey consumption, Karen Collins, M.S., R.D., a registered dietician from the American Institute for Cancer Research, states that whey is a safe and healthy ingredient in foods since levels of pesticides and hormones are not concentrated in whey (2). Whey protein concentrates are of particular interest to the practitioner due to their wide-range and near full-blend of essential and non-essential amino acids, which are commonly referred to as the building blocks of life. Linked amino acids combine to form proteins. These protein comprise nearly every tissue and organ in the body, therefore any supplementation of the diet with proteins may be beneficial to injury repair, metabolism, and general health. The importance of whey products has gained prominence within the last 5 years. Asia is the leading exporter of whey produce, exporting an estimated 15,680,683 kg in 1992 and 16,184,519 kg in 1995. This represents~ 60% of all worldwide exports. The leading importer of whey is North America, which in 1995 brought in an estimated 26,444.593 kg . This amount represents a 5 fold increase in imported product over a four year span and nearly 90% of all worldwide imports of whey(3). Commonly whey is prepared from cheese products such as cheddar cheese. In accordance with the Ohio State University method(11), whey is prepared from milk using lactic acid culture and rennet as a coagulant. The milk is HTST (High Temperature Short Time) pasteurized (163° F, 30 seconds) and held overnight at 40°C then warmed to 30° C and inoculated with 1.5% cheese starter. After incubation for 30 minutes, 38.7 ml rennet extract is diluted with cold water and added to 50 gallons of milk with stirring. Twenty-five minutes later curd is cut and cooked by gradual warming to 38-40°. Cover a thirty minute time interval while the temperature is maintained for 1.5 hours. The whey is then drained through a stainless steel screen and separated at 55° C.
Whey Protein is produced by ultrafiltration at 45° C after addition of 20 g of citric acid with the pH adjusted to 3. After ultrafiltration to 1/5 the original volume, the retentate is diafiltered with addition of 20 g citric acid at pH 3. The concentrated whey is warmed to 40°C and spray dried to, provide whey protein concentrates. This WPC (protein 79.9% and calcium 0.136%) is then used to prepare laboratory scale samples and the WPC solutions are freeze dried(3). Additional micro-filtration techniques may be added to increase the protein yield to ~95%. Many whey products are then put through an ion-exchange process to remove fat and lactose. In this procedure the cold-filtered protein concentrate is put through a static electrical charge which separates undesirable fractions from the WPC. However, there is a price to pay for this process. The immunoglobulin fraction is greatly reduced(4). The end product is a whey protein isolate that is relatively fat, lactose, and sugar-free product possessing a high amino acid (protein) concentration. In addition to the before-mentioned procedures, some manufacturers hydrolyze their WPC to produce di-, tri-, oligo-, and polypeptide (long and short-chain amino acids). It also provides for a variety of amino acids, with special emphasis on the branched-chained amino acids (L-leucine, L-isoleucine, and L-valine), in addition to important amino acids such as L-cystine and glutamine, all of which are essential for wound healing, immunity, and cellular nitrogen retention. note: Hydrolyzing breaks apart peptide bonds. The ion-exchange and hydrolyzing process used on whey protein permanently modifies the native structure. The protein is denatured and the biological activity is ended. The real nutritional value of WPC’s lies in their abundance of amino acids. For example the typical WPC contains up to 18 amino acids, which nearly represents the full blend(57). Alanine, arginine, and aspartic acid are three common amino acids found in numerous whey proteins. Alanine aid in the metabolism of glucose, whereas arginine causes retardation of tumors and assists in the release of growth hormones and the maintenance of a healthy immune system. It also provides an environment for an increase in muscle mass and body fat reduction, in addition to being an essential ingredient of protein synthesis. Aspartic acid increases stamina, therefore it is good for fatigue. It also aids in RNA/DNA synthesis. Cysteine/cystine are perhaps two of the more important amino acids found in WPC. They are helpful in detoxifying toxins and are precursors to the body’s most potent antioxidant, glutathione. They promote the burning of fat and are useful in the treatment of rheumatoid arthritis and bronchitis. Due to the possible toxic effects of cysteine at high levels it is not a recommended supplement. 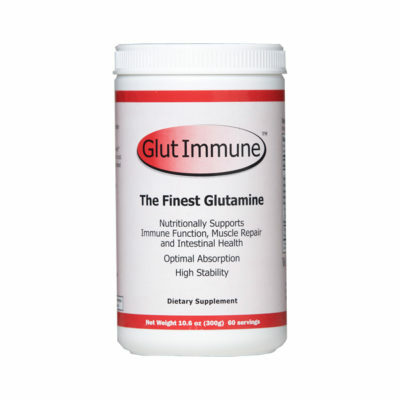 Glutamic acid and glutamine are essential to nervous tissue function. Glutamic acid is a neurotransmitter for retinal neurons and is commonly referred to as “brain fuel” since the brain converts it to a compound that regulates brain cell activity. It is also a precursor to glutathione. Glutamine is important to cellular nitrogen retention and is important in alcoholism, mental ability, impotence and maintaining a healthy digestive tract. Glutathione, a potent antioxidant, is important for the safe metabolism of the hydrogen peroxide free radical. It helps protect against radiation and oxidative damage and is the body’s best defense against the formation of cataracts, age-related macular degeneration (ARMD), cancer, and immunity. This important protein will be discussed in detail later in text. The essential amino acids are well represented in most WPC’s. They can’t be manufactured by the body and therefore must be obtained through dietary consumption. They consist of the branched-chained amino acids, lysine, phenylalanine, methionine, and tryptophan. The three branched-chained amino acids are leucine, isoleucine, and valine. They are essential to tissue growth and repair, and promote the healing of bones, skin, and muscle. They also regulate blood sugar levels, so they must be taken in a balance to insure proper regulation. Lysine, methionine and tryptophan are also found in many WPC’s. Lysine is an essential building block for all protein and helps to maintain proper nitrogen balance. The body uses methionine to derive the brain food, choline. It also aids in digestion, as well as serving as a fat burner. It can interact with other substances to detoxify harmful agents, and is essential for the production of cysteine and taurine. L-Tryptophan acts as a sleep aid, as demonstrated by the drowsy feeling we sometimes experience after Thanksgiving dinner (turkey meat has a relatively high amount of tryptophan.). It is also necessary for the production of niacin and is used by the body to make the neurotransmitter, serotonin. The rational for using WPC’s to attain this dietary level of nutrition is that 25 grams of powder provides approximately 20 grams of amino acids. To achieve this level of nutrition taking tablets or soft gels would require taking 48 to 60 units per day, which would be difficult and expensive. A large number of weightlifters and bodybuilders use WPC’s during their training regimen. They sometimes utilize a three step process which consists of stacking, “cycling”, and “cutting”. The initial stage, stacking involves taking two or more compounds at one time to maximize results. They may take WPC and or creatine or chromium. This is then followed by cycling, in which large doses of a supplement is used to change the level of body fat. Some will use 10 or more one ounce WPC servings a day. This should be approached with caution since large doses of protein consumption may present challenges to the liver. The final stage, cutting, involves maximizing the muscle bundles for visualization. This is the point in which the bodybuilder aspires to achieve that “cut up” appearance. It is important to consult a physician before attempting any of these extreme methods. Australian researchers claim that whey extract could become a standard treatment for chronic wounds, especially ulcerations from diabetes and hypertension. Initial experiments using a whey extract containing a number of natural growth factors excelled at spurring cells to grow thus prompting this essential step in the body’s normal repair of injuries(32). The compound also encouraged rapid wound healing in rats and pigs(32). Scientists working on a joint government-industry project at the Cooperative Research Center for Tissue Growth and Repair in Adelaide, Australia have patented a process for mitogenic bovine whey extract which is unique as a naturally-derived cocktail of growth factors in which 1000 L of milk yields 30 grams of extract. When the extract is mixed with a collagen gel and applied to wounds it enhanced the healing of surgical incisions. These observations have their origin in the fact that whey protein contains high levels of amino acids which may be important to wound healing. These amino acid include arginine, glycine, and particularly the branch-chained amino acids (BCAA) leucine, isoleucine and valine, which are essential to promote healing of bones, skin, and muscle tissues. Another amio acid, proline, aids in the production of collagen, heals cartilage and strengthens joints, tendons and cardiac muscle. 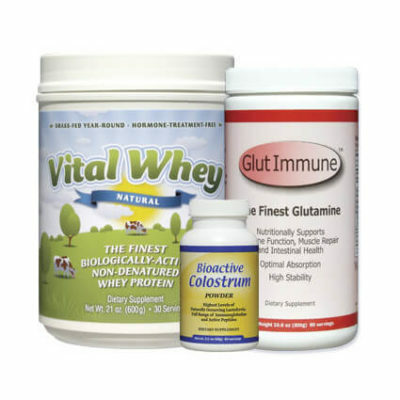 In order to understand the mechanisms beneficial biochemical interactions and possible whey protein potential health benefits of WPC, a brief biochemical review of the protein Glutathione is required, since it is this protein more than any other that has been thought to provide a protective function for a number of organ systems, including the crystalline lens of the eye, the retina, prostate gland, and the immune system. L-cysteine is the rate limiting substrate in this reaction12 , while the rate controlling enzyme for the reaction is L-gamma -glutamylcysteine synthetase(5) . The 2 major functions of glutathione are to detoxify hydrogen peroxide (H2O2) and other organoperoxidases (free radicals) and to defend against oxidation within cells via the Glutathione Redux Cycle, or more commonly referred to as the Scavenger Pathways(6,7). The disulfide is then reduced with the co-enzyme NADPH in the prescene of the enzyme Glutathione Reductase to yield the original glutathione compound. Many theories of aging and disease are based upon the interaction of the formation of free-radicals and the subsequent reduction in glutathione levels which allows for an accumulation of free-radicals to remain within a cell and organ or organ system. Free-radicals that remain within cells may cause cell damage, DNA damage and may even cause cell death, cancer transformation or loss of cell immunity to viral or bacterial infection. To fully appreciate the manner in which supplementation with WPC may be beneficial to maintenance of ocular tissues, let us look at the processes of cataractogenesis and oxidative insult to the retina. The exact mechanism of cataract formation follows a strict ordered sequence. Initially, in the pre-cataractous state, a cascade of early cataract-related changes occurs resulting in an oxidative insult to the cell membrane and to the amino acids methionine and cysteine (17-20). This can be caused by x-rays, photochemical insult, hyperbaric oxygen levels 18 and other causes. The remaining cascade of events then proceeds in the following manner: (a) unfolding of protein structures, which exposes the protein thiols making them available for further oxidation, (b) di-sulphide linked aggregate formation, and (c) a decrease in enzymatic activity (glutathione peroxidase) which protects and repairs damage (17,18,20). It is at this stage that the cataract truly begins to develop accompanied by a change in the lens Redux ratio, decreased ATP levels, and a change in cation permeability which induces an influx of H2O (water) within the cell membrane(17-20). The site of initial damage according to Spector(18) occurs in the lens epithelium. The causative agent at this point is thought to be primarily the hydrogen peroxide radical, which in the absence of glutathione, may now accumulate unopposed. These free-radicals which are defined as molecules with an one or more unpaired electrons in their outer orbit, which attempt to stabilize their charge by stealing an electron from the outer shell of a stable neighboring molecule setting off a chain-reaction sequence(6), causes DNA damage to the lens epithelium cells(21). Examination of lens epithelial cells at the time of cataract surgery usually reveals an ongoing pattern of programmed cell death (apoptosis)(18) which may be documented by evaluation of lens chromatin fragmentation(21) . In the case of experimentally UV-induced cataracts, exposure to the UV radiation generated hydrogen peroxide, superoxide and DNA damage(21,31). The consequences of this action is to degrade the lens crystalline, decrease transmembrane voltage, reduce glutathione stores(24), decrease enzyme activity, and increase in prostaglandin production(25). It is interesting to note that no significant change in the non-protein thiols occurred until 85% of the lens epithelium cells were already dead(21). The major role of glutathione in the crystalline lens of the eye is to provide lens clarity via maintenance of the limiting anterior epithelial cell layer and to correct and/or halt oxidative damage to the lens(5). Arnold was perhaps the first investigator to discover the presence of glutathione in the lens, and it is now clearly evident that the highest concentration of glutathione is found in the lens epithelium(6) , which has a 5X greater concentration than in the second most glutathione rich site, the lens cortex. The nuclear region of the lens is primarily devoid of GSH(5,6). It is well is established that lenticular glutathione levels decrease with age (5,6,8) ranging from a concentration of 3.5 umol/g at age 20 and decreasing to 1.8 umol/g at age 65. It is inferred that it is this age related reduction in GSH which is in part responsible for cataract formation in the elderly. In fact, Reis was the first to note the lack of GSH in cataractous lenses(5). In addition, a number of substances which inhibit GSH synthesis, such as Buthionine Sulfoximine(16) produce cataracts in experimental conditions. It is interesting to note that glutathione levels are unchanged in some reversible forms of cataracts, such as those induced after the administration of diquat(5). Reduced GSH levels is a precipitating factor age-related cataract formation(7). To further illustrate this point, researchers at Alcon Laboratories have used aldose reductase inhibitors to halt the progression of certain cataracts(13). The importance in this finding is that aldose reductase acts competitively to reduce levels of GSH and its inhibition allowed GSH levels to remain high. As mentioned previously, glutathione and it’s enzyme, glutathione peroxidase has great importance in regards to the elimination of free-radicals within the lens. Recent reports indicate that glutathione metabolizes chronic low levels of free-radical production26 typical of normal metabolism and the most potent anti-oxidant in the lens system. This point is illustrated by the inability of other enzymes, such as catalase to limit lens damage caused by hyperbaric oxygen(27) and H202(28,29). Glutathione is essential for the maintenance of tissue ascorbate (Vitamin C) and alpha-tocopherol (vitamin E) levels (30) according to Mrtensson. He found that as GSH levels decreased, a corresponding decrease in ascorbic acid and vitamin E followed, which led to systematic mitochondrial death, which in turn leads to a cessation of cellular metabolism(31). The regional distribution of glutathione in different cataracts is of interest. Pau (et al 9) found that in primary nuclear and supranuclear cataracts, there was only a slight decrease in GSH levels relative to the subcapsular and (20) nuclear, implying a different mechanism for various cataract types and possibly a different mode of non-surgical intervention. Experimental data has shown that supplying the lens with additional glutathione, particularly in the form of the peroxidase increases delays cataract development and may even prevent cataract development(23). This may be accomplished my enriching the aqueous with the glutathione precursor amino acids or glutathione directly(10) . Glutathione in conjunction with vitamin E added as a supplement to a galactose diet did halt opacification of cortical cataracts in the animal model15. Further evidence for GSH infiltration into the lens comes from the identification of glutathione transporters in the lens epithelium(11). Taking glutathione orally has not been shown to raise tissue levels of glutathione. Taking WPC which contains high levels of cystine, the rate-limiting substitute for the production of glutathione, may be helpful for the prevention of cataracts. It is widely accepted that lipid peroxidation plays a major role in retinal light damage(58). The vertebrae retina is known to contain relatively high levels of antioxidants and anti-oxidant enzymes(59). Among these are three members of the glutathione system, glutathione peroxidase, reductase, and transferase. The others are catalase and superoxide dismutase (60). When levels of these antioxidants begin to decrease with increasing age(59, 60) , retinal changes associated with macular degeneration begin to develop. This is particularly true for glutathione peroxidase and catalase(59, 60) . The method oxidative damage occurs is due to light or heat damage and then coupled with the age-related reduction in GSH(px) and catalase allows for the propagation and accumulation of the free radicals, making the retina susceptible to further damage(60). Stone and Dratz (61) found evidence of glutathione-dependent enzymes in the outer segments of rats and suggest that since these membranes are rich in polyunsaturated fatty acids, they are susceptible to free-radical induced peroxidation. Therefore when RPE disruption occurs with early ARMD, which limits the amount of phagocytosis occurring, coupled with the age-related reductions in antioxidant activity, adverse retinal changes are manifested and may proceed unchallenged. It may therefore be possible to replenish or revitalize the antioxidant activity of the retina by dietary supplementation primarily with a glutathione or precursor to halt the progressive lipid peroxidation occurring during ARMD. Primarily the process of enhancing the immune response is accomplished through the replenishment of glutathione (GSH). It has been theorized that the ability of lymphocytes (CD4 cells) to correct oxidative damage is determined by their capacity to regenerate intracellular stores glutathione which allows them to respond vigorously to a wide variety of antigens(33). In 1981, researchers discovered that mice fed a non-denatured whey protein concentrate exhibited a marked increase in antibody production in response to T-cell dependent antigens(36). Numerous experiments in subsequent years have confirmed this early observation (37,38,39,40,41,42,43,44). Thus, enhanced immunity against colds and hepatitis and most dramatically pneumococcal infection(42) could be accomplished through dietary supplementation with whey protein concentrates (WPC’s). An interesting peripheral observation was that the immuno sustaining effect of the protein mixture found in whey was unrelated to its nutritional efficiency and as a result of this phenomenon this unique property was defined as the bioactivity of the product(33). This bioactivity occurs through the ability of the protein concentrate to help replenish glutathione levels via continuous dietary provision of glutathione precursors, especially cysteine, during lymphocyte proliferation, thus supporting an optimal immune response. This process seems to not only increase intercellular levels of GSH or GSH precursors at the time of ingestion, but also builds up stores of these substances within the cells which lasts for a substantial post-ingestion time interval(33). The proposed bioactivity is dependent upon three bioactive proteins contained in whey, serum albumin, lactoferrin and alpha lactalbumin. These proteins contain a high number of cysteine/cystine residues, an important GSH precursor. Serum albumin contains 17 cysteine/cystine residues/ 66,000 MW molecule and 6 glutamylcysteine dipeptides(39). Lactoferrin contains 17 cysteine/cystine residues/ 77,000 MW molecule and four gluatmylcysteine dipeptides, while alpha-lactalbumin contains 4 residues per 14,000 Mw molecules (39). It is these residues which are primarily responsible for replenishment of GSH stores. Two major theories of oncology both implicate GSH as a putative protective factor due to its dual role as a antioxidant and detoxifying agent. Free radical accumulation is thought to be a major factor in tumor formation (45). In fact at least twelve carcinogens have been identified that are detoxified by GSH conjugation. These are: aflaxotoxin B1, N-acetyl-2-aminofluorene, benzanthracene, benzopyrene, benzidine, dimethyl-hydrazine, 1-nitropyrine dimethylnitrosamine, ethylmethane sulfonate, N-methyl-4-aminobenzene, 7-methylbenzanthracene and 3-methyl-cholanthracene (46,47,48). Further evidence supporting the anti-tumor forming capacity of whey protein is illustrated by a University of Wisconsin study in which hormones known as androgens are responsible for depleting GSH levels in the prostate. This relatively GSH-free environment is thought to promote prostate carcino-genesis in men (49). This condition can be reversed in vitro by increasing colonial levels of GSH via continuous whey protein supplementation. As in carcinogenesis, free-radical accumulation has been implicated in producing a variety of diseases associated with aging (50).These maladies result from the toxic accumulation of these materials due to the absence or reduced levels of GSH. Diseases such as Alzheimer’s (51), Parkinson’s 52, and arteriosclerosis53 all appear to be preceded or associated with cellular organ or organ system reductions in GSH. Therefore much speculation has arisen regarding the potential benefits supplementation with whey protein may provide in these cases. If results obtained from other organ system studies are of any indication results could be promising. 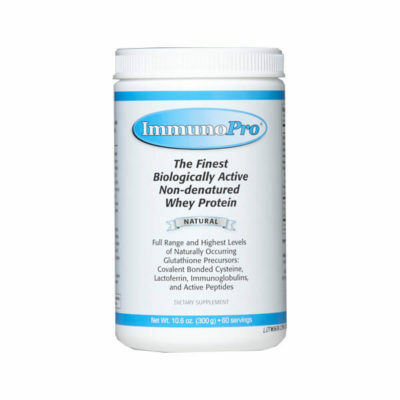 The mechanism by which whey protein concentrate yields an enhanced immune response has already been discussed. Recently this knowledge has been applied to the treatment of HIV infected individuals. Staal (et al 34) reported that HIV-infected individuals have lower GSH concentrations in their blood lymphocytes, while Herzenberg (et al 35) found that the more glutathione patients carry in their CD4 helper T-cells, the cells primarily targeted by the HIV virus, the greater the chance of increased longevity exists. More recent claims have stated that supplementation with whey protein concentrates (WPC’s) may help AIDS patients maintain body weight and in some cases limit wasting syndrome. In a pilot study WPC’s were given to a population consisting of 14 AIDS infected children (ages 8 months-15 years) in an attempt to limit determine the efficacy of daily oral dietary ingestion of whey proteins. They found no toxic side effects and an average weight gain of 3.2 – 18% from their entrance weight(54). A. Robert Neurath M.D. and his colleagues at the Laboratory of Biochemical Urology at Lindsley F. Kimball Research Institute of the New York Blood Centers has reported that a modified version of protein extracted from whey blocked the aids virus from infecting cells in vitro(55). In their National Institutes of Health sponsored study the scientists modified beta- lactoglobulin to produce a substance referred to as B69. They reported that B69 latched onto a protein structure called CD4 on the surface of cells which kept the aids virus from using this site as an entryway into the cell. Newarth further hypothesized that if additional results with B69 were promising, the compound may be formulated into a cream or foam that could be dispensed within condoms to limit the transmission of the virus. Dr. Jefferey Laurance, an AIDS researcher at Cornell Medical College, however, urges caution regarding B69 developments. He states that HIV can infect some cells , including rectal and vaginal cells, without using the CD4 site as an entryway. In summary, animal studies have yielded promising reports regarding prolonged life spans of infected animals in the laboratory, while theoretical data(56) and initial clinical observations in humans have produced evidence that dietary supplementation with WPC’s can provide definite benefits to the HIV infected individual. Further research, however, is warranted in this area. 1 Choi, MJ. and Mangino, M.. The Effect of Pre-heating Conditions on the Gelation of Whey Proteins. Preliminary Report. Preprint. pgs 1-11, 1997. 2 Collins, K.. Is Whey Good for You? How do Cooking Oils Differ? Medical Tribune News Service, 1997. 3 Exports and Imports of Whey products. Statistics, Canada, Dairy Section, AAFC, 1997. 4 1 Nutrition, Frequently Asked Questions.AST Research Communique, 1997. 5 Rathburn, WB. Glutathione in Ocular Tissues. 469-510. 6 Rathburn, WB. Gutathione Metabolism int the Mammalian Ocular Lens. 194-206. 7 Reddy, VN. Glutathione and its Function in the Lens – An Overview. Exp Eye Res.50:771-778, 1990. 8 Hockwin, O. and Korte, I.Role of Glutathione in the Aging Process of the Lens. 207-214. 9 Pau, H., Graf, P., and Sies, H.Glutathione Levels in Human Lens: Regional Distribution in Different Forms of Cataract. Exp Eye Res 45: 17-20, 1990. 10 Harding, JJ. Free and Protein-Bound Glutathione in Normal and Cataractous Human Lenses. Biochem J. 117, 957-960, 1970. 11 Kannan, R., Yi, JR., Tang, D., Zlokovic, BV., Kaplowitz, N.. Identifcation of a Novel, Sodium-Dependent, Reduced Glutathione Transporter in the Rat Lens Epithelium. Invest Ophthalmol. Vis Sci 37:11: 2269-2275, 1996. 12 Rathburn, WB., and Murray, DL. Age-related Cysteine Uptake as Rate-limiting in Glutathione Synthesis and Glutathione Half-life in the Cultured Human Lens. Exp Eye Res. 53: 205-212, 1991. 13 Lou, MF., Dickerson Jr., JE., Garadi, R., and York Jr., BM.Glutathione Depletion in the Lens of Galactosemic and Diabetic Rats. Exp Eye Res 38:517-530, 1988. 14 Spector, A., Wang GM., and Wang, RR..Photochemically Induced Cataracts in Rat Lenses can be Prevented by AL-3823A, a Glutatthione Peroxidase Mimic. Proc. Natl. Acad. Sci. USA 90: 7485-7489, 1993. 15 Creighton, MO., and Trevithick, JR..Cortical Cataract Formation Prevented byVitamin E and Glutathione. Exp Eye Res. 29: 689-693, 1979. 16 Maitra, I., Serbinova, E., Trishler, H., and Packer, L.. Alpha-lipoic acid Prevents Buthionine Sulfoximide-induced Cataract Formation in Newborn Rats. Free Radical Biology and Medicine 18:4: 823-829, 1995. 17 Spector, A. Oxidation and Cataract.Symposium Paper. 1984 Human Cataract Formation. Ciba Foundation Symposium 106, 48-64, 1984. 18 Spector, A., Wang, GM., Wang, RR., Li, WC., and Kuszak, JR.. A Brief PhotochemicallyInduced Oxidative Insult Causes Irreversible Lens Damage and Cataract I. Transparency and Epithelial Cell Layer. Exp Eye Res. 60: 471-481, 1995. 19 Spector, A., Wang, GW., Wang, RR., Li, WC., and Kleiman, NJ.. A Brief Photchemically Induced Oxidative Insult Causes Irreversible Lens Damage and Cataract II. Mechanism of Action. Exp Eye Res. 60: 483- 493, 1995. 20 Spector, A.. The Search for a Solution to Senile Cataracts Proctor Lecture. Invest Oph. and Vis Sci. 25: 130-146, 1984. 21 Li, WC., and Spector, A.. Lens Epithelial Cell Apoptosis is an Early Event in the Development of UVB-induced Cataract. Free Radical Biology and Medicine 20:3: 310-311, 1996. 22 Li, WC., Wang, GM., Wang, RR., and Spector, A.. The Redox Active Components of H2O2 and N-Acetyl-L-Cysteine Regulate Expression of c-jun and c-fos in Lens Systems. Eye Exp Res. 59:179-190, 1994. 23 Spector, A., Wang, GM., Wang, RR., Garner, WH., Moll, H.. The Prevention of Cataract Caused by Oxidative Stress in Cultured Rat Lenses. I H2O2 and Photochemically Induced Cataract. Curr Eye Res. 12:2: 163-179, 1993. 24 Hightower, KR., McCready, JP.. Mechanism Involved in Cataract Development FollowingNear-ultraviolet radiation of Cultured Lenses. Curr. Eye Res. 11:679-689, 1992. 26 Tumminia, SJ., Chambers, C., Qin, C., Zigler Jr., S., and Russell, P. Curr Eye Res. 15: 845-851, 1996. 27 Giblin, FJ., Schrimscher, L., Chakrapani, B., and Reddy, VN.. Exposure of Rabbit Lens to hyperbaric Oxygen in Vitro: Regional Effects on GSH Level. Invest Ophthalmol. Vis. sci. 26:8: 1312-1319, 1988. 28 Giblin, FJ., Reddan, Jr., Schrimscher, L., Dziedic, DC., and Reddy, VN.. The Relative Roles of the Glutathione Redox Cycle and Catalase in Detoxification of H2O2 by Cultured Rabbit Lens Epithelial Cells.. Exp Eye Res. 51: 795-804, 1990. 29 Garland, D.. Role of Site-specific, Metal-catalyzedOxidation in Lens Aging and Cataract: A Hypothesis. Exp Eye Res. 50: 677-682, 1990. 30 Mrtenssson, J., and Meister, A.. Gluathione Deficiency Decreases Tissue Aswcorbate Levels in Newborn Rats: Ascorbate Spares Glutathione and Protects. Proc. Natl. Acad. Sci. USA 88:4656-46460, 1991. 31 Varma, SD., Kumar, S., and Richards, RD.. Light-induced Damage to Ocular Lens Cation Pump: Prevention by Vitamin C..Proc. Natl. Acad. Sci. USA 76: 3504-3506, 1979. 32 Daily InScight.. A Better Whey to Heal?. Academic Press, 1997. 33 Fidelus, RK., Tsan, MF.. Glutathione and Lymphocyte Activation: A Function of Aging and Auto-immune Disease. Immunology 61: 503-508, 1987. 34 Staal, FJT., Roederer, M., Israelski, DM., Bubp, J.. Intracellular Glutathione levels in T cell Subsets Decreases in HIV-infected individuals. AIDS Res and Hum Retroviruses 8: 305-311, 1992. 35 Herzenberg, L., De Rosa, S., Dubs, G., Roederer, M.. Glutathione Deficiency is Associated with Impaired survival in HIV Disease. Proc Natl Acad Sci USA 94: 1967-1972, 1997. 36 Bounous, G., Stevenson, MM., Konshavn, PAL.. Influence of Dietary Lactalbumin Hydrolsate on the Immune System of Mice and Resistance to Salmonellosis. J. Infect. Dis. 144: 282, 1981. 37 Bounous, G., Kongshavn, PAL.. Influence of Dietary Proteins on the Immune System of Mice. J. Nutr. 112: 1747-1755, 1982. 38 Bounous, G., Letourneau, L., Kongshavn, PAL.. Influence of Dietary Protein Type on the Immune System of Mice. J. Nutr. 113: 1415-1421, 1983. 38 Bounous, G., Kongshavn, PAL.. Differential effect of Dietary Protein Type on the B-cell and T-cell Immune Response in Mice. J. Nutr. 115: 1403-1408, 1985. 40 Bounous, G.,Shenouda, N., Kongshavn, PAL., Osmond, DG.. Mechanism of Altered B-cell Response induced by Changes in Dietary Protein Type in Mice. J. Nutr. 115: 1409-1417, 1985. 41 Bounous, G., Kongshavn, PAL., Gold, P.. The Immunoenhancing Property of Dietary whey Protein Concentrate. Clin. Invest. Med. 11: 271-278, 1988. 42 Bounous, G., Kongshavn, PAL.. Influence of Protein Type in Nutritionally Adequate Diets on the Development of Immunity. In: Friedman, M. ed. Absorption and Utilization of Amino Acids. Boca Raton, Florida: CRC Press. 2: 219-223, 1989. 43 Parker, N., Goodrum, KJ.. A Comparison of Casein, Lactalbumin, and Soy Protein Effect on the Immune Response to a T-dependent antigen. Nutrit. Res. 10: 781-792, 1990. 44 Hirai, R., Nakai, S., Kikuishi, H, Kawai, K.. Evalaution of the Immunological Enhancement Activities of Immunocal. Otsuka Pharmaceutical Co. Cellular Technolgy Insitiute, 1990. 45 Ritchie, JP.. The Role Glutathione in Aging and Cancer. Exp Gerontol 27: 615-626, 1992. 46 Newberne, PM, Bulter, WH.. Acute and Chronic Effects of Aflatoxin B1 on the Liver of Domestic and Laboratory Animal: A Review. Cancer Res 29: 236-250, 1969. 47 Meerman, JHN., Beland, FA., Ketterer, B., Srai, SKF.. Indentification of Glutathione Conjugates Formed from N-hydroxy-2-acetylaminofluorene in the Rat. Chem Biol Interact 39: 149-168, 1982. 48 Boyland, E., Sims, P.. The Metabolism of Benz(a)anthrracene and Dibenz (a,h)anthracene and Their 5,6 di-hydro Derivatives by Rat Liver Homogenates. Biochem J. 97:7-16, 1965. 49 Waterfall, JF., Sims, P.. Epoxy Derivatives of Aromatic Polycyclic Hydrocarbons. The Properties and Metabolism of EpoxidesRelated to Benzo(a) pyrene and to 7-8 and 9-dihydrobenzo(a)pyrene. Biochem J. 128: 265-277, 1972. 50 Blumberg, JB., Meydani, SN.. Role of Dietary Antioxidants in Aging. In: Nutrition and Aging. Hutchinson, MG., Munro, HN. (Eds.) New York: Academic Press, 85-97, 1986. 51 Jeandel, C., Nicholas, MB., dubois, F., Nabey-Belleville, F.. Lipid Peroxidation and Free Radical Scavengers in Alzheimer’s Disease. Gerontology 35: 275-282, 1989. 52 Ebadi, M., Srinvasan, SK., Baxi, MD.. Oxidative Stress and Antioxidant Therapy in Parkinson’s Disease. Proc Neurobiol 48: 1-19, 1996. 53 Kuzuya, M., Naito, M., Funaki, C., Hayahi, T.. Protective Role of Intracellular Glutathione Against Oxidized Low Density Lipoprotein in Cultured Endothelial Cells. Biochem Biophys Res Commun 163: 1466-1472, 1989. 55 The Associated Press News Release. Whey Eyed as AIDS Blocker. The Associated Press, New York, New York, 1995. 56 Noelle, RJ., Lawrence, DA.. Determination of Glutathione in Lymphocytes and Possible Association of Redox state and Proliferative Capacity of Lymphocytes. Biochem J. 198: 571-579, 1981. 57 Balch, JF., Balch, PA.. Presciption for Nutritional Healing. Avery Publishing Group, Garden City Park, New York, 27-31, 1990. 58 Taylor, A., Jaques, PF.. Oxidation and Aging: Impact on Vision. In: Sies, H., Erdman, J., Williams, G. (Eds.) Proceedings International Conference on Antioxidants. Princeton, New Jersey, Univ. Press, 1992. 59 Newsome, DA., Miceli, MV., Liles, MR.. Antioxidants in the Retinal Pigment Epithelium. In: Prog Retinal Eye Res. 13: 101-123, 1994. 60 Dovrat, A., and Gershon, D.. Rat Lens Superoxide Dismutase and Glucose-6-phophate dehyrogenase: Studies on the Catalytic Activity and the Fate of Enzyme Antigen as a Function of Age. Exp Eye Res. 33: 651-655, 1981. 61 Stone, WL., and Dratz, EA.. Selenium and Non-selenium Glutathione Peroxidase Activities in Selected Ocular and Non-Ocular Rat Tissues. Exp Eye Res. 35: 405-412, 1982. 62 Rathbun, W.B., Holleschau, A.M., Cohen, J.F., Nagasawa, H.T. Prevention of Acetominophen and Naphthalene – Induced Cataract and Glutathorne Loss by CySSME. Invest Ophthalmol. 37:5: 923-9, 1996.